Illia Barger has stated, "One of the successes of trompe l'oeil is to draw in someone two blocks away, who otherwise would not be interested in it. But they want to know what it is they're seeing. Is that real brick ... a real tree? The disbelief is the magic carpet that brings them there." For more about artist Illia Barger, visit her website www.illiabarger.com. The Videos page of her website contains a News 12 New Jersey story about Barger's work on the mural. N Warren St. and N. Broad St.. This monument commemorates the American victory at the first Battle of Trenton on December 26, 1776. Hessian troops had occupied Trenton since December 14, 1776, while Washington's army encamped on the Pennsylvania side of the Delaware River, following their retreat across New Jersey beginning in Fort Lee on November 20. On the morning after the famous Christmas night crossing of the Delaware River by Washington and his troops, the Americans surprised the Hessian Troops stationed in Trenton. Most of the fighting was centered in the area running roughly from this monument south a half mile down, between Warren Street (then called King Street) and Broad Street (then called Queen Street). American artillery was positioned at the site where the monument now stands. As it was the high ground, it offered an excellent position for the cannons to fire down on the Hessian positions. The earliest intentions to build a monument to the Battle of Trenton date back to 1843. However, it took a half century for the monument to become a reality. 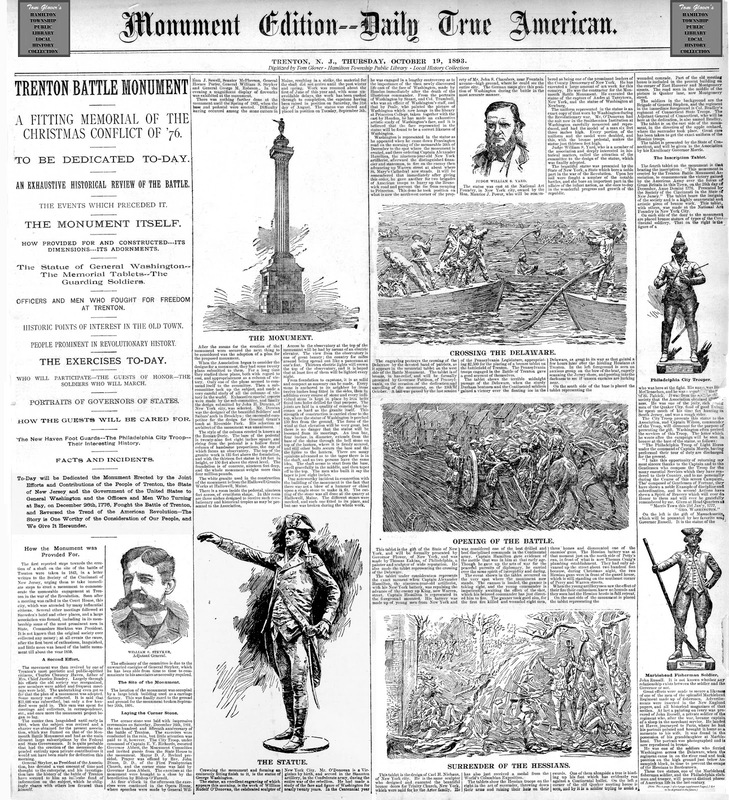 Work finally began on the Trenton Battle Monument in 1891; it was unveiled on October 19, 1893, the 112th anniversary of the American Victory at the Battle of Yorktown. The dedication ceremony was a major event in Trenton, with speeches and a parade. In an article several days before the dedication ceremony, The New York Times indulged in a bit of hyperbole, stating, "The indications are that it will be the greatest day in the history of New Jersey." Local businesses and government buildings were decorated for the occasion, and a grandstand was erected around the monument to seat 3,000 people. Then-President Grover Cleveland (the only President to have been born in New Jersey) was expected to attend and speak, but he did not. "The house is two stories high, spacious and elegant, having three rooms with fireplaces. besides a large dining room with two fireplaces on the lower floor. five rooms on the second floor, a large and convenient kitchen, a cellar under the whole, a pump at the door, a convenient lot with a stream of water running through it and an excellent garden - a stable sufficient to contain eight horses, with room for hay to keep them, may he had with it." Reverend John Rosbrugh, who served as the chaplain of the 3rd Battalion of the County PA Militia, is also buried here. He was bayoneted to death by Hessian soldiers at the Second Battle of Trenton on January 2, 1777 (See Second Battle of Trenton Site entry lower on this page). St. Michael's Church was built in 1703. It was located in the center of the fighting during the First Battle of Trenton. Prior to the Battle, Hessians had used the building as a barracks during their occupation of Trenton. It was later used by the Continental Army as a hospital. There is a plaque on the front of the church marking the route General Washington took from Philadelphia to Cambridge, Massachusetts in 1775 to assume command of the Patriot Army. On June 15, 1775, he had been appointed Commander in Chief of the Continental Army by Congress in Philadelphia. He passed through Trenton on June 23, and he would arrive in Cambridge to take command of the army on July 3. Another plaque marking Washington's route is located in New Brunswick. This house was built in 1719 by William Trent, from whom the town of Trenton takes its name. After Trent's death in 1724, the house passed through several owners. From 1742 - 1746, the house, then called "Bloomsbury Court," was used as the official residence of then-governor of New Jersey, Lewis Morris. Hessian soldiers occupied the house in December 1776, until the Hessian defeat at the first Battle of Trenton. Even before the Battles of Trenton, this Quaker Meeting House had been touched by the war. At some time in the first half of 1776, American troops stayed at the meeting house. During the first half of 1776, the meeting house was occupied by American troops en route from Pennsylvania to Amboy and Woodbridge. This apparently caused concern to Quakers who, because of their pacifistic beliefs, were opposed to any involvement in the war. They had no way of knowing that their meeting house would soon be occupied by both Hessian and British troops, and would be in the middle of actual combat. S. Broad St. and Assunpink Dr. Following the First Battle of Trenton on December 26, Washington's army returned to their camp on the Pennsylvania side of the Delaware River. After some discussion concerning what to do next, the plan was made by the end of the following day to follow up their victory with another battle. They would return to Trenton (no longer occupied by Hessians, after their defeat on the 26th) and wait to be attacked by British and Hessian forces that would be converging on the town. On January 29 and 30, Washington and his army again re-crossed the Delaware River into New Jersey to take up defensive positions in Trenton. This time they would be in the role of defending, rather than attacking, the city. However, unlike the Hessians at the First Battle of Trenton, the Americans would not be surprised by their attackers; they were waiting and planning for the attack that they knew would come. The American troops successfully defended the bridge over the Assunpink Creek which stood near what is now the southwest corner of Mill Hill Park. A historic sign at the entrance to the park describes the events: "On this site, late in the afternoon of January 2, 1777, General Washington's 'Little Band' of determined men and boys won the second Battle of Trenton. Having amassed a great concentration of artillery and small-arms power, the Americans withstood three powerful charges by the enemy and exacted a heavy toll in killed and wounded. This stand enabled the Americans to outflank the enemy during the night and march on to another victory at Princeton, thus completing the ten days that kept a dying Revolution alive." Another sign, on the other side of the park, gives information about the history of the Mill Hill Historic District, including the Second Battle of Trenton. "General Washington encompassed as he was by dangers, had but a brief statement to submit to his council; the situation of the two armies were known to all; a battle was certain, if he kept his ground until the morning, and in case of an action a defeat was to be apprehended; a retreat by the only route thought of, down the river would be difficult and precarious; the loss of the corps he commanded might be fatal to the country: under these circumstances he asked advice - opinions were various - some inclined to retreat, others to hazard all on a general engagement, and it has been suggested to me, that the commander in chief, yielding to his natural propensities, favoured the latter proposition." The army proceeded to advance on Princeton in the evening and to attack at Princeton the following morning, January 3, 1777. Although victorious at the Battle of Princeton, the second part of the plan, an attack on New Brunswick, was not made. Instead the army headed from Princeton to Morristown, where they would stay in winter quarters from January 6 - May 28 . These twelve obelisks mark the route taken by General Washington and his troops after the Second Battle of Trenton to the Battle of Princeton. Although these markers work their way through Hamilton, Mercerville, Lawrence and into Princeton, they are all listed and pictured here on the Trenton page for the sake of convenience. "The obelisks are to be made of the best Quincy granite and will be rock faced on all four sides. They will be eight feet tall, but two feet of this length will be set in the ground, imbedded in concrete, to make their removal all but impossible. They will be one foot six inches on each side. Bronze tablets, one foot wide by sixteen inches tall, will be set in the front face of each obelisk at little above the middle of the length. They will be recessed in the rock and fastened with the greatest firmness and by means of bolts that will be invisible from the surface of the tablets. The bolts will, morever [sic], be located at points in the tablet that would scarcely be suspected." First Obelisk - Hamilton Avenue at South Broad Street. In front of the Sun Center National Bank. Second Obelisk - Hamilton Avenue at Chestnut Avenue. In front of Bank of America. Third Obelisk - 1800 Hamilton Avenue. Fourth Obelisk - 1070 Klockner Road. In Front of the Health Careers Center. In front of the VFW. -In Median on Quarkerbridge - Partly hidden in the trees. D & R Canal State Park Trail, right by the parking lot. - In the woods behind the house, on the walking path. A set of doors on the building features bas reliefs of George Washington, Marquis de Lafayette, Benjamin Franklin, and Alexander Hamilton. South Broad St. and Lafayette St.
After entering Trenton on April 21, 1789, en route to being inaugurated the new nation's first President, George Washington passed through a triumphal arch at this spot, which is now marked by the small plaque on the brick wall. This was the same bridge location where Washington's army had held off the British attack during the Second Battle of Trenton. "On the bridge over the creek which passes through the town, was erected a triumphal arch highly ornamented with laurels and flowers: and supported by thirteen pillars, each entwined with wreaths of evergreen. On the front arch was inscribed in large gilt letters, THE DEFENDER OF THE MOTHERS WILL BE THE PROTECTOR OF THE DAUGHTERS. "At this place, he was met by a party of matrons leading their daughters dressed in white, who carried baskets of flowers in their hands, and sang, with exquisite sweetness, an ode of two stanzas composed for the occasion." The song they sang not only honored Washington; it also made the contrast between Washington's circumstances at this spot in 1776-1777, and the the joy of the current moment as he went to assume the role of first president of the United States, tying together these two great New Jersey moments. Welcome, mighty Chief, once more! Aims at thee, the fatal blow. Build for thee triumphal bowers. Strew, ye fair, his way with flowers. Strew your hero's way with flowers." "General Washington cannot leave this place without expressing his acknowledgments to the matrons and young ladies who received him in so novel and graceful a manner at the triumphal arch in Trenton, for the exquisite sensations he experienced in that affecting moment. "The astonishing contrast between his former and actual situation at the same spot; the elegant taste with which it was adorned for the present occasion; and the innocent appearance of the white robed choir, who met him with the gratulatory song, have made such impressions on his remembrance, as, he assures them, will never be effaced." After leaving Trenton, Washington continued on across New Jersey. He was greeted with receptions along the way at Woodbridge, Rahway, and Elizabeth. Monday - Thursday: 11:00 a.m. - 7:00 p.m.
Friday - Saturday: 9:00 a.m. - 5:00 p.m.
A section of the Washington Triumphal Arch described in the above entry is displayed in the library's Trentoniana room. The Trentoniana room is devoted to local Trenton history, with large local and genealogical collections. This 17 ft. by 12 ft. mural of George Washington passing through the triumphal arch currently hangs inside the Thomas Edison State College. The painting's official title is "Reception to Washington on April 21, 1789, at Trenton on his way to New York to Assume the Duties of the Presidency of the United States." South River Walk Park is an esplanade along the Delaware River. It features a series of historical plaques set into pavement that tell the history of Trenton from the 1600's to the present, including a number of plaques related to Revolutionary War era events. The book states that the Court House "stood on the east side of Warren Street, just south of State Street," which would have placed it on the other side of Warren Street from where the mural is. An article about the Declaration of Independence's being read in Trenton on July 8, 1776 appeared in several newspapers in late July 1776, including:. 3. ^ Diana Cercone, "Illia Barger Specializes in Creativity," Bucks County Herald [Bucks County, Pennsylvania], December 8, 2011, Page C12. • Nadine Sergejeff , Damon Tvaryanas, Ian Burrow, Richard Hunter / Prepared for The Old Mill Society The Assunpink Creek In Mill Hill A History And Consideration Of Historic Interpretive Opportunities (2002) Chapter 3: "Present-Day Land Use"
One of the photos in the collection shows this statue where it stood at the Centennial Exposition. The statue is visible on the right side of the photo. It looks a bit small in the photo, but if you look closely, you can tell it is this statue. This photo can be found here at The Centennial Exhibition Digital Collection. 6. ^ Sign erected by the Trenton High School class of 1904 on February 22, 1902. "At one side of the doorway of the monument appropriately guarding the entrance, stands a bronze statue of Private John Russell, of Captain John Selman's Company of the Regiment of the Continental Line, organized in Massachusetts by Colonel John Glover. This regiment distinguished itself aiding the American Army to escape over the East River to York City after the battle of Long Island, and again in the historic crossing of the Delaware River on the night before battle of Trenton. This soldier's likeness is taken from a medallion executed in Paris, France, after the war, when he was in that city, having crossed the ocean as captain of a sloop in merchant service. He is represented in the uniform of this splendid regiment of Marblehead Fishermen, as worn in December, 1776. It is placed on the monument by the patriotic of the Commonwealth of Massachusetts. 'The Philadelphia Troop of Light Horse under the command of Captain Morris, having performed their Tour of duty are discharged for the present. 'I take this opportunity of returning my most sincere thanks to the Captain and to the Gentlemen who compose the Troop for the many essential Services which they have rendered to their Country, and to me personally during the Course of this severe Campaign. Tho' composed of Gentlemen of Fortune, they have shewn a noble Example of discipline and subordination, and in several Actions have shewn a Spirit of Bravery which will ever do Honor to them and will ever be gratefully remembered by me. "It [the statue] is the gift of the Troop now known as the First Troop Philadelphia City Cavalry, an organization which has existed since the Revolutionary period." "Revolutionary Relic - Workmen are now engaged in demolishing the house in Warren Street, opposite Perry, long known as the City Hotel. This house is probably over a hundred years old, and at the time of the Revolution was one of the largest and most elegant houses in the town. It was occupied by Colonel Rall, the commander of the Hessians, and was his headquarters at the time of the Battle of Trenton. It bears many marks of that combat, in the shape of bullet holes and marks in the weatherboards, and tradition relates that a Hessian officer was shot through one of its windows while shaving himself. The window with the bullet hole through the glass is preserved by Dr. Quick, the owner of the house." The quoted 1785 description of the Stacy Potts house ("The house is two stories high, spacious and elegant...) originally appeared in an advertisement to rent the house in the State Gazette on January 10, 1785. That advertisement was itself reprinted to accompany their June 12, 1857 article about the demolishing. 10. ^ Plaque on the church, placed by the New Jersey Society of Sons of the Revolution on February 22, 1919. • Johann Rall's original gravestone is no longer in the cemetery. However, his name appears on a plaque in the cemetery listing "Names of persons interred in the west yard of the church whose markers have been destroyed by time." The plaque was erected in 1933 by the General David Forman Chapter, Daughters of the American Revolution. Another modern plaque in the cemetery states that it is "Erected to the memory of Colonel Johann Gottleib Rall died 26 December 1776." • A stone to Reverend John Rosbrugh in the cemetery was erected by the Presbytery of New Brunswick in 1917. 12. ^ There are two markers at the site identifying this as the location of Fitch's shop. One was a placed by the city of Trenton. The other by the Kiwanis Club of Trenton in 1990. • The Trenton Historical Society book, A History of Trenton, 1679-1929: Two Hundred and Fifty Years of a Notable Town with Links in Four Centuries (Princeton, Princeton University Press, 1929), supports this as the location of the gunshop. In Chapter 2, Hamilton Schuyler stated that "John Fitch, then a gunsmith, had a shop on King Street." In the same chapter, she explains that the King Street of that time is now Warren Street. • The City of Trenton sign here states that the shop was "damaged by the Hessians in 1776." The Trenton Historical Society book, A History of Trenton, 1679-1929: Two Hundred and Fifty Years of a Notable Town with Links in Four Centuries, (see above footnote) states, "The shop was burned by the British in 1776." The Wescott biography does not mention the fate of the shop after Fitch left the city. Because of the confusion (Hessians or British; damaged or burned), I have chosen to leave mention of this out of the main entry. However, I will state here that it makes sense that the gunshop would have been targeted in some way by the opposing forces after Fitch fled Trenton. 14. ^ Monument bears a City of Trenton New Jersey seal, and states that is was "Erected by the commissioners of Trenton November 30, 1921" and "Relocated to this site Spring, 1998." 20. ^National Register of Historic Places Registration Form submitted for the Trenton Friends Meeting to the United States Department of the Interior, National Park Service, received August 13, 2007. Prepared by Sheila Koehler of Westfield Architects & Preservation Consultants. This document provides details about the church's construction and the alterations / additions made in the 1800's. "The Meeting Mouse in Trenton belonging to friends having been used by the Convention or Congress of this Province to meet in and also the Soldiers in passing through from Pennsylvania to Amboy and Woodbridge have been quartered therein. Therefore this meeting appoints Isaiah Robins, Amos Middleton, John Bullock, Benjamin Clarke and Benjamin Linton to inspect into the case and see how far our Antient [sic] Testimony against Wars hath been maintained and supported and report to next Meeting." 22. ^ Gravestone and markers at the cemetery. Note that Wilkinson was not present at the council. At the time he was serving as an aide to General St. Clair. Wilkinson states, immediately before the text quoted, that "It may be proper to remark, that what follows with respect to the council of war, I received from General St. Clair, to whose person I was attached." Also, Wilkinson mistakenly recalls that the council may have occurred at the home of Mary Dagworthy, rather than the Douglass House. But by his phrasing, he himself makes it clear that he was not certain of the location. He wrote that the council occurred "if memory serves me, in the house of a Miss Dagworthy" (emphasis added). 32. ^ The plaque over the entrance, placed by the New Jersey Society of Pennsylvania on December 11, 1915, mentions Congress meeting here, the Lafayette farewell, and the George Washington reception. • This plaque only gives the opening date of the Congress session. The opening and closing dates of this session are given on the website of the United States Senate. • For more source information about Washington's reception at City Tavern, see Source Note 28 above. Another plaque on the building identifies this as the site of the New Jersey ratification of the United States Constitution. This sign has the Great Seal of the United States, but no further credit for who posted the sign. It does note that "the one hundred and fiftieth anniversary of the ratification of the Constitution was here celebrated on the 11th day of November 1937." • John Marshall, who was the fourth Chief Justice of the Supreme Court, famous for the Marbury vs. Madison decision, was a contemporary and admirer of Washington. His five volume biography of Washington was originally published between 1804 - 1807, within a decade of Washington's death (December 14, 1799). 35. ^ • The New Jersey State Historic sign at the Ferry Site states, "Reception held in City Tavern." "This famous tavern stood on the southwest corner of King (now Warren) and Second (now State) Streets. From April 1, 1780, to February, 1781, it was called the Thirteen Stars, but when John Cape became proprietor in 1781 he changed the name to the French Arms, which name was retained until January 4, 1785, when the tavern was leased to Francis Witt. He had been the proprietor of a tavern on North King Street, called the Blazing Star, and merely transferred the sign to his new establishment. The name was again changed, this time to the City Tavern, in April 1789, when Henry Drake became its proprietor." This information places the site of City Tavern at the corner of what is now Warren and State Streets. This is now the One West State Street building. • The One West State Street building itself has a sign over the door, placed by the New Jersey Society of Pennsylvania on December 11, 1915, telling of the history of this location, including, "And here General Washington dined and afterwards held a reception with the principal citizens of Trenton April 21, 1789, while en route to New York to assume the duties as first President of the United States." 36. ^ The plaque at this site, which reads, "At the bridge over the Assunpink Creek on April 21, 1789, the citizens of Trenton honored George Washington as he passed through a triumphal arch on his way to New York City to be inaugurated President of the United States," was placed by by the Kiwanis Club of Trenton in 1989.